This is for all the people who have ever looked in a mirror and listed off numerous flaws with their bodies. This is for every person who strongly believes he or she is not good enough. This is for anyone who feels that the world would be better off without his or her body “taking up space.” This is for me and for you and for everyone else who does not believe they are perfect enough. We live in a society that pushes perfectionism, and an extreme perfectionism at that. For women, the ideal beauty is a thin but curvy frame. For men, their ideal figure is strong, masculine and tan. The South Carolina Department of Mental Health estimates 8 million Americans (7 million women and 1 million men) suffer from some form of an eating disorder. From anorexia nervosa to bulimia to binge eating disorders, eating disorders have the highest mortality rate of any mental disorder. 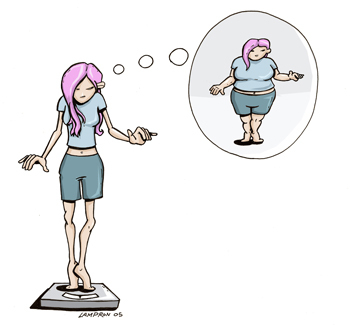 Despite popular belief, eating disorders are about more than just the desire to be thin. They are an all-encompassing illness that stems from low self-esteem and the desire to be perfect. It is a heartbreaking disorder, one that some people don’t understand unless they have been personally affected. As someone who suffers from an eating disorder, I have experienced the consuming cycle of eating and not eating as I try to achieve perfectionism. I have lost friends during my battle, and I have lost time. I have skipped parties because I was concerned with either not eating anything or eating everything in sight. So much energy and time have been wasted over the past five years. National Eating Disorder Awareness Week starts today, February 20, and goes on through February 26. It is a time for light to be shed on an mental disorder that many people do not fully understand. A few events are being held this week at UNC. The movie Thin, a documentary about eating disorders, will be shown in Room 3411 at the Student Union tonight at 5:30 P.M. Viewers will also be able to ask Dr Anna-Bardone Cone, a UNC psychology professor specializing in eating disorder research, questions. On Monday, February 21, McAllister’s Deli on Franklin Street will donate 10% of its revenue from 5 P.M. to 9 P.M. to Carolina House, an eating disorder treatment center located in Durham. Make sure to print off the flyer. Interactive Theatre Carolina will also be performing skits on eating disorders in the Union Cabaret on Tuesday, February 22, from 6 P.M. to 8 P.M. Even after Tuesday, bringing awareness to eating disorders should not end. If you have friends who are suffering, let them know that you are there for them. And if they don’t have treatment, help them find it. If you are currently suffering, please seek help. There are people out there that care for your well-being. Even I am here to help support you, so don’t be afraid to contact me. I have been in your shoes, and I still am. There is one last thing I want to leave. You are beautiful or you are handsome just the way you are. You have been shaped into the way you were meant to be. You were given a unique body and your own mind. Perfectionism is just an idea. It is never tangible. Accept yourself and others for who they are, and remember that imperfections are what is truly perfect. I am not a big fan of winter. I am a very cold-natured person, and my body does not take well to cold weather. My hair — which is normally soft and shiny — gets dry and brittle and uncooperative. My hands — my poor, soft hands — become dry and cracked and alligator-like. And my face — which is sensitive anyways — is extra dry and red. When I look in the mirror, I try to remind myself that it’s not just me suffering from winter beauty blues. But then I see girls walking around campus in the cold with their beautiful, shiny locks and “un-splotchy” faces. I become jealous. This jealousy has led me to researching for hours about proper winter hair care. After all, these women I see can’t simply be free of winter’s destructive powers. While staying up late one night working hard on my winter skin research, I recalled a book my mother gave me before I left for college. Fast Beauty: 1000 Quick Fixes. I sprung out of my bed and began searching my bookshelf for this “Beauty Bible.” Eventually I found it nestled between The Bombshell’s Manual of Style and The Prophet. I clutched the treasure across my chest and jumped back onto my bed. Holding the book in my hands, I felt the power rush into my body. Before me laid a book that would unlock the answers for combatting the winter-time blues. It was almost too much. After several minutes, I finally cracked the book open to the index. I searched for the word “winter” and found an expanded list of “hair and scalp care,” “hand and nail” and “skin care.” My heart skipped a beat. If I followed the guidelines in the book, people around campus would soon be jealous of my hair and skin. I flipped to the “hair and scalp care” pages. Then I turned to the “hand and nail” and finally “skin care.” For hours I read the book, soaking in this newly, found beauty knowledge. To combat dry hair and a splotchy face, use plain yogurt with a bit of honey. Soak nails in warm milk to regain strength. There was so much to learn and take in, and I quickly lost track of the time. Finally, my eyes darted to my bedside clock. 4:30 AM! I couldn’t believe I had spent three hours researching. I had to be up in two hours. I began to freak out when I realized the sleep deprivation would be easy to spot the next morning. But then I realized the answer laid in my lap. I flipped to the index and began my research for combatting sleep-deprivation.